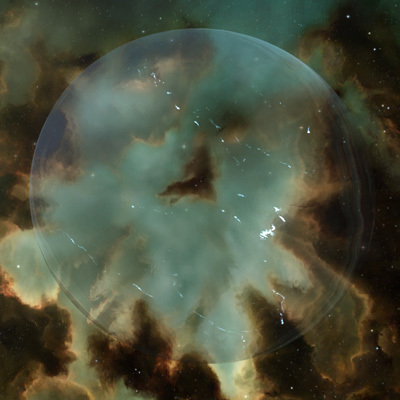 Bubbles are a form of area-of-effect warp disruption which only work in nullsec. There are a few different kinds of bubble; the most common is the anchorable bubble (also known as a mobile warp disruptor), an object which can be launched and anchored much like a secure container and which will remain in position until destroyed. 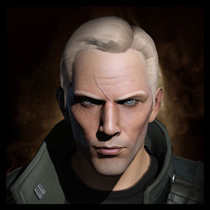 Bubbles can also be launched by both interdictors and heavy interdictors, which we'll talk about a little more later. While the method of producing these bubbles is different, the core mechanics are identical. The most basic function of a bubble is to prevent ships from entering warp. Any ship which is inside the radius of a bubble (with the exception of tech 3 cruisers which have the interdiction nullifier subsystem fitted) will be unable to enter warp until the bubble is removed or the ship is has moved outside of the bubble's area of effect. If a bubble is put up covering the ship or a ship moves into a bubble while it is still aligning for warp, its warp will be cancelled. In addition, bubbles can be used to intercept people exiting warp, causing them to land in the bubble instead of at their intended destination. These are known as Drag or Catch bubbles depending on their positioning relative to the gate (they may also be referred to as Pull and Stop bubbles, which are the same thing). Drag or Pull bubbles are positioned behind the object which you're warping to, while Catch or Stop bubbles are positioned in front of it, based on the direction from which you're warping. Obviously in practice having both on one gate would be pointless. In both examples below, any pilot warping to this stargate along the white line would be caught by the bubble. If they were warping along the red line however, the direction of their warp would never pass through the bubble and so they would land on the gate as expected. When you are caught by a bubble, you will exit warp roughly on the leading edge of the bubble. The momentum of larger ships will generally carry them well inside of the bubble itself, however smaller ships will often come to a stop just inside or even just outside of the bubble edge. Obviously if you do land inside the bubble, you will not be able to initiate warp until you get back outside of it. The point on the bubble edge where targets are expected to land is known as the 'catch point', and bubble campers will generally have a scram/web tackler or two sitting at this point to catch incoming ships, as well as jettisoned cans to decloak covert ops ships and other cloakies. It's important to note that the exit point of your warp is determined when you click the warp button, not when your ship actually enters or exits warp. This means that if a bubble goes up after you've clicked warp but before you land, it will not catch you. Similarly if a bubble is up when you hit warp but subsequently goes down, you will still land as if you were caught by the bubble. Drag and catch bubbles could be placed anywhere, however you'll most commonly encounter than on stargates. Note that they only work when positioned on grid with your destination, so bubbles anchored to catch at the gate which you entered from will not affect you. Again, t3 cruisers with the Interdiction Nullifier subsystem will not be caught by drag bubbles and will land at their intended desgination regardless. Note that if the location that you're warping to is completely covered by a bubble, you will land at the edge of the bubble regardless of the direction which you warp from. Anchored bubbles are fairly straightforward - they're launched from your cargo just like any other anchorable structure, at which point you can right click on the bubble and anchor it. Anchoring can take anything from 1 minute for a t2 small bubble up to 8 minutes for a t1 large bubble. T2 bubbles take half the time to anchor of their t1 variants, while each size of bubble takes twice as long as the next size down. These bubbles can be targeted and destroyed, and while large bubbles tend to be very tough, smaller bubbles can be killed fairly quickly by only a handful of dps ships. Providing it is not destroyed, an anchored bubble will remain in space until you choose to unanchor it. Anchored bubbles make particularly good drag and catch bubbles, since they will remain in position independent of your ships, and since they're always up you don't need to worry about missing a target because you didn't get your bubble up fast enough. Interdictor bubbles (also known as warp disruptor probes) function slightly differently - rather than being anchored, they are deployed instantly. Dictor bubbles cannot be targeted (although they can be destroyed by area of effect weapons such as smartbombs), and only last for 2 minutes; once their time is up, the bubble will simply disappear. Like anchorable bubbles, they will remain in position until that time is up. Interdictor bubbles are relatively larger at 20km, and due to their size and instant deployment they are very effective for catching targets coming through a gate. Heavy interdictor bubbles are different again. These are projected around the heavy interdictor itself, and move with the ship as it travels (the heavy interdictor cannot warp or go through a gate while its bubble is up, nor can it travel particularly fast since the effectiveness of afterburner and MWDs is significantly reduced while the bubble is active). Like regular dictor bubbles the HIC bubble is deployed instantly, and it will remain active until the module is disabled (the HIC bubble generator has a cycle time of 30 seconds). Like regular dictor bubbles, the HIC's bubble generator is popular for bubbling directly on a gate. "the heavy interdictor cannot warp or go through a gate while its bubble is up"
I believe a heavy interdictor can still go through a gate with its bubble up. I wasn't sure if a recent patch that made dictors gain aggression when deploying a bubble would similarly affect heavy dictors. I'm pretty sure it doesn't cause aggression for a heavy dictor unless someone tries to enter warp while in the bubble. I tested this while writing the article - it's odd. I get an aggression message when I have the bubble up which prevents me going through a gate, but as soon as the bubble goes down I can go through (i.e. it doesn't give you a proper 1 minute aggression timer like everything else does, it just classifies you as aggressed while the bubble is currently up). How effective is bumping a Hic while its bubble is up? I know its mass goes near 0. Does this mean it's possible to give it a significant bump while its bubble is active? HIC Pilot here. If someone tries to warp out of your bubble, it's considered an aggressive act (so the 1 minute timer is activated), otherwise, it's like a psuedo-agressed state (against yourself) while your bubble is up. Regarding bumping HICs - I only did a little testing on this, but I actually found I could bump the HIC further when it had it's bubble down. Using a standard nanocane vs a shield tanked broadsword, I tended to bump it around 5km with bubble down and 2km with bubble up. This is possibly because with low mass it also becomes incredibly agile, meaning that while the bump gives it a large amount of initial speed, it slows down again very quickly. It is possible to jump through wormholes tho while your bubble(s) are activated in a HIC, regardless of aggression. Quite useful for wormhole engineering. Sweeeet thanks for this. I only encounter bubbles occasionally (not really a null sec dweller, heh) but this clears up all the questions I had about them. Great guide! Recently went into Nullsec to explore a bit and have had a bunch of questions about bubbles. This information is definitely good to have, thank you! Is it possible to place a bubble on a station (IE: So it is impossible to insta-undock)? Yes. You can't anchor a bubble at 0 on the station, but you can place a bubble so that the undock is within its area of effect. Okay, that's good to know. One person I asked said the bubble couldn't be anchored so any part of it touched the station model, so I was unsure. Ooh, I thought of two more questions. One is specific to bubbles, the other more general. First, can you "logoffski" right after jumping through a gate (while still under gate cloak/invulnerability). What happens in that case? I'm guessing you'll uncloak as you begin your emergency warp, right? Second, if you're in a bubble, the game can't emergency warp you if you "logoffski", right? Does the game start you moving in a random direction until it gets out of the bubble and then attempt to warp (assuming you make it that far)? If you disconnect/log off while inside a bubble, your ship will *not* emergency warp - it will just sit still (it won't move at all) and eventually disappear. If you've been aggressed already, that means it'll sit still inside the bubble for 15 minutes or indefinitely if someone continues to shoot you. If you log before being aggressed, I believe your ship will disappear after the usual logoff timer, but simply wont emergency warp. I'm not sure whether cloak would drop immediately after logging or once it wears out naturally - I haven't tested it. I found this line quite interesting "It's important to note that the exit point of your warp is determined when you click the warp button, not when your ship actually enters or exits warp." I always assumed it would be the moment you enter warp. Now it doesn't really make much difference in most situations, but it does make a difference if you are taking a slow aligning ship from a POS to a hi-sec gate/WH. I would normally align first and then hit warp when I'm sure there is no bubble. But I guess I might as well just hit warp when verified there is no bubble and not tip off any cloaky by actually aligning first. That won't really help you since after hitting warp you won't have actually entered warp until after you've aligned, and if you hit warp instead of align you may not be able to cancel your warp. His point is that whether a bubble catches you is determined *when you hit the button*, not when you actually enter warp. If there is no bubble up when you hit the warp button, then you will not be caught even if a bubble goes up before you enter warp. When warping within a single grid, if there is a bubble between the two points, you cannot initiate that warp. It errors out. I *think* this is caused by the fact that this would result in a warp of less than 150km, which is a big no no mechanically. That's right. When you get caught by a bubble, it seems that what the came actually does is just say 'warp to X' where X is not your destination, but the edge of the bubble. That explains why the deciding point is when you click the warp button, and also explains what you've experienced. If the leading edge of the bubble is closer than 150km and your destination is on grid (meaning the bubble would catch you), trying to warp through it is treated as if you were trying to warp to an object less than 150km away - nothing happens. I wouldn't think there is a problem with a less than 150km warp. If you are 150km from something and warp to within 100km you are only warping 50km. Doesn't seem like its a game mechanics issue. Maybe that bubble was less than 50km away? I tested it quite extensively when I first noticed this happening. If the catch point of the bubble (not the bubble object itself) is within 150km, your ship doesn't even try to initiate warp through it unless the object you're warping to is off grid - it just aligns, and that's all. A catch point 160km away will let you warp, 140km away will not. I guess the difference is in the way the game calculates the warp. I expects it treats the edge of the bubble as your warp *target* (rather than treating it as warping to your intended target at an unintended range), and then cancels the warp command when it checks to see if the target is at a valid range. "as well as jettisoned cans to decloak covert ops ships and other cloakies." So this means that the bubble itself will not decloak your ship? and can you recloak while still inside a bubble? The physical bubble itself will decloak (that is, the anchored object in the centre), but only if the cloaked ship gets within 2000m of the object iself. The projection of the bubble will not decloak things, since it isn't a physical object. Since most cloaky ships have fairly low inertia, the chances of them landing within 2000m of the bubble's core even on a small bubble are practically zero - even battleships only drift in a few km. Hence having ships and cans on the catch point is necessary. And yes, providing nobody has targeted you you can still recloak while inside a bubble. Have you played with 'double-stop' bubbles at all? I watched a youtube video of a medium catch bubble placed just under 150km(on-grid?) from a gate, and a large t2 bubble just over 150km(off-grid?) from the gate, so that it overlaps the medium bubble. The idea being that a ship will not be stopped by the Large t2 bubble because it is anchored too far from the gate, and will be stopped at the edge of the medium bubble, which is smack in the center of the large t2 large bubble, leaving you with 40km of bubble to escape. Does this actually work? How difficult is it to pop an bubbles (both anchored and HIC/Dic) with smartbombs. Is it worth fitting one if you're traveling through null? No, it's not really practical. Anchored bubbles are much too tough (and you can lock them anyway), dictor bubbles you could potentially kill (it takes 4 cycles of a large smartbomb to kill one), but you'd rarely be in a situation where they would be useful. That's quite a common misunderstanding of the mechanics, and the in-game explanation actually makes them sound like they work that way. However, it isn't how they actually work - bubbles only drag if on grid with your destination. Just a quick note on HIC's, When they have their bubble active, they cannot recieve Remote Repair from logistics ships or drones. However, I believe they can take RR when they go "bubble red" (ie, when they choose to turn off bubble module and wait the 30 seconds for it to finish its cycle.) So you can go bubble red, take some reps from logi, then go green again as soon as cycle ends. If you jump into a system and find that local is empty, if you are in a fast ship and not in a hurry to get anywhere, make bookmarks approx 200-300km off gate in a direction that has no gates/celestials, then if the gate is bubbled on your return journey, you have a "tactical" to warp to, you can check the gate and also avoid any drag/catch bubbles that are anchorred.